So the last time we spoke I had just finished the SWAP ALL THE CLOTHES event, and had the first big weekend for the Rockabilly Bakeshop market stall. I am happy to report that everything went well and although we don't get to do the bakeshop often it still remains one of our favourite things to do, and will hopefully get it back up and going very soon. Since my life rarely is constant and normal, another enormous event occurred back in the middle of June. Steve and I got the opportunity to move to Dover and manage a pub called The Eagle. So, 2 weeks later we moved, out and away from London sadly and into the little somewhat unexciting town of Dover. It's now been a long and very busy July and part of August. I have barely had a second to think about my lovely little blog, or making jewellery (which I am longing to do) or even about getting dressed in more than jeans and a boring T-shirt with my hair up. I must say it is a sad state of affairs when I have recently acquired some amazing new pieces in my closet. I am vowing today to pull them out and take photos of outfits, because it's only that they be shared with the world. Although I am not super keen on Dover as a town, I have totally fallen in love with Canterbury and have a real soft spot for Folkestone. I think it's the fact that both places have a buzzing arts community that I feel more at home when I'm there. Dover is very much a port town which people tend to pass through without really stopping and the town lets it happen without really making an effort to grab the tourists along the way. Anyways, I didn't come back to bore you with my whereabouts, but if you are in Dover, please come up to the Eagle for a visit, I am here Wednesday to Sunday all day. Also, if you anyone fancies holding an event, we have an event room, so maybe later down the road we could organise a Kent swap or meet up or something fun like that! 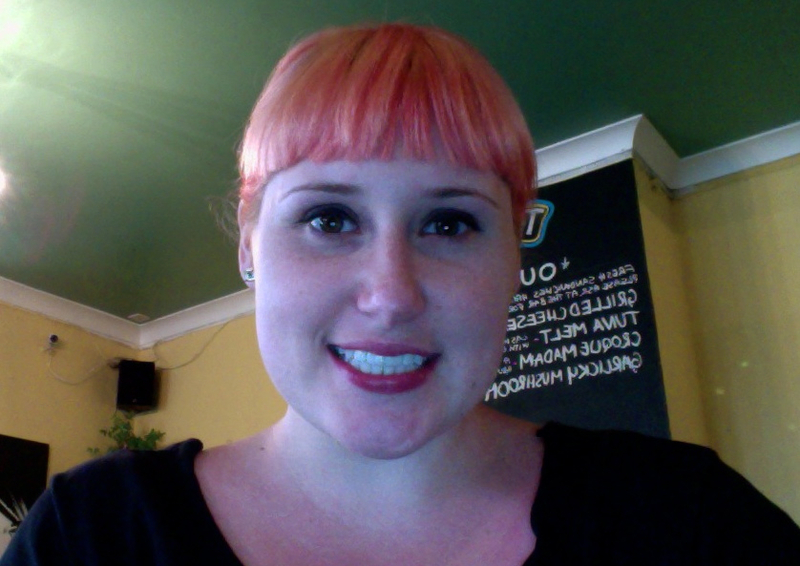 Ok so here is me now, flamingo pink hair and fancy new eyebrows done by the amazing Benefit Brow bar in Spitalfields, London. It was my first time getting them waxed and it really wasn't that bad, nor do I think it looks weird or over the top. THANK GOODNESS! And now I will share with you a couple of the things I have acquired lately - proper photos of me with them to come once I finish cleaning out my closet and organising. First, this is probably my most favourite skirt ever. I will also say that a size 20 would easily fit a size 22 for those of you who are shy with the non plus sized items. The waist is stretchy and I find it quite big on me. 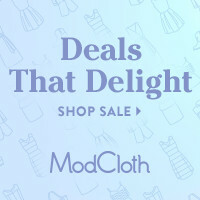 You can find the skirt on the Collectif website - I am also awaiting the day that they make the button down shirts in sizes bigger than 18 for us bustier girls. Next, I am having my dearest mumsy bring me over a new back pack when she visits from Canada as the epic Vegan bag company Matt & Nat had a sale. You can purchase the bags online in the UK as well, but since my Mum offered I thought I would make the most of the Canadian dollar while I could. 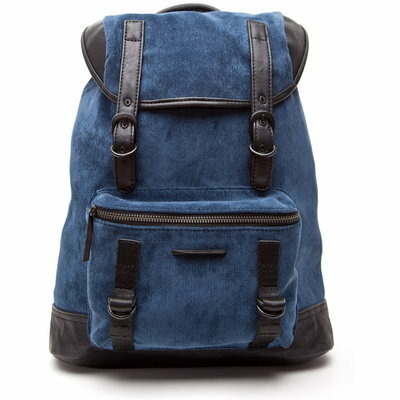 Although I haven't seen the bag in the flesh, other than over Skype, I am told it is like blue canvas feeling material with awesome leather looking straps just like the picture. I can't wait to travel someplace with it when I get it in early October! Hurry up Mum! 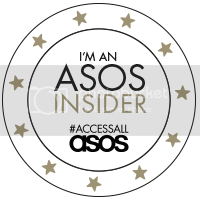 My next purchase will be this amazing skirt from Asos that I saw on another wonderful blogger, Lolly Likes Fatshion. 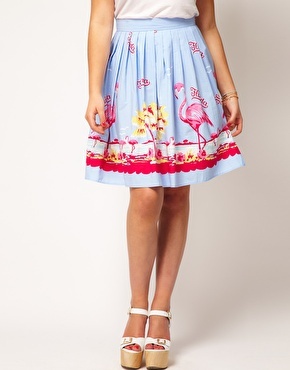 I want this flamingo skirt and it is low in stock so I am feeling the pressure. I've been doing a lot of Rockabilly styled things lately and I really think this would fit right in -justification at it's best! katie! Que de bouleversements dans ta vie! I miss you a lot! Je prendrai un visa pour venir à Douvres surtout que c'est moins cher que Londres! 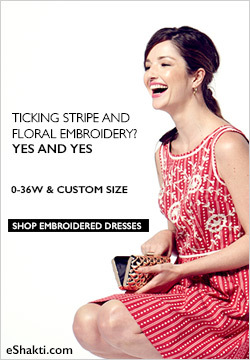 I can't wait to see photos of you in that skirt! Looks awesome! Love the backpack too, way to go Mumsi!! !